Teaching Baseball Catching would never be considered complete until a catcher learns to framing a Pitch, which is a delicate art that should be practiced every time a catcher is receiving a throw as a catcher such as Bullpen work, warming a pitcher up, anytime you are working in a pitcher - catcher relationship. It is the ability to convince the umpire a border line pitch is, in fact a strike. Remember, umpires are human too, and as such periodically through out the game will hesitate as their mind and eye try to arrive at a ball - strike decision. This decision making process occurs in milliseconds, but your baseball catching could have an influence in the outcome. So how do you do it? The Key is to have the ability to master an art of being able to perform smooth, intricate and slight movements of the wrist and mitt as the ball is caught. As you catch a borderline pitch, the instant the ball enters the mitt you quickly and slightly move your wrist towards the strike zone. Remember the pitch is borderline so the slightest movement towards the strike zone could be enough to induce a strike call, especially if the pitch is in an area which has been called a strike. Do not attempt to frame a pitch which is an obvious ball. All that does is make you look stupid and aggravates the umpire that you think he’s that dumb. Do not hold a position after the call is made. Most umpires do not make a verbal call of a ball, so you’ll need to develop a mental clock in which time span if you don’t hear a verbal strike call, you return the ball to the pitcher. Pitches low in the strike zone if possible, must always be caught with the mitt up. If you must turn the mitt downward to catch a ball, the umpire will always consider the pitch too low to be a strike. Another way to practice framing pitches is to utilize a pitching machine as they are an excellent instrument for catching practice. Most of the better machines will allow you to dial in the type of pitch, speed and target. This is an excellent way to learn your trade. When using a pitching machine always wear your face mask. 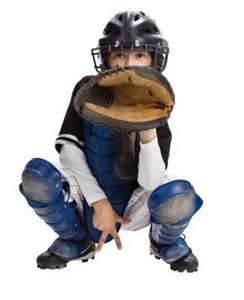 It’s an excellent idea to always wear your mask no matter catching a pitcher, coach or machine. Catcher Communication between a Pitcher and a Catcher is similar to a waltz or a ballet. Beautiful, flowing each knowing what the other asks and what is expected. No head banging here. Too chaotic. The catcher should be the “Take Charge” portion of the Pitcher / Catcher relationship, because there are numerous pitchers and only one catcher, therefore he’s the only stable constant in the duo. 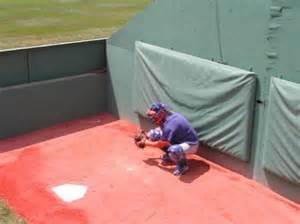 He should set up, taking in consideration an individual pitcher’s quirks, the pre-game routine. 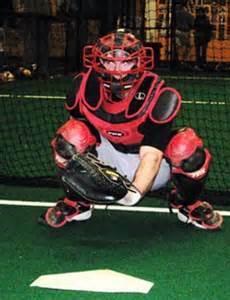 While taking warm up pitches from the starting pitcher (always wear full equipment) the Catcher must analyze the quality and control the pitcher has over his arsenal of pitches. Everyday is different. Some days the pitcher may have razor sharp control over his curve ball, but the velocity on his fastball is off or there isn’t as much movement as usual. It is crucial the Catcher note this as he’ll be calling the pitches during the game. Another portion of the pre-game check is to go over the signals together. Try and keep them simple and easy to remember for both of you. I usually had my catcher maintain the same finger signs for each different pitch, but change the indicator. Doesn’t matter what system you use as long as it works. 1 finger for a fastball. 2 fingers for a curve ball. 3 fingers for a slider. Wiggling four fingers for a change up. These are only suggestions and of course there would be additional signs for additional pitches such as a knuckle ball, split finger fastball and etc. Remember ... As important as it is for your pitcher to see the signs, it’s just as important the opposition doesn’t see them. Number 1 rule, only give signals when the pitcher is on the rubber. Open your legs wide enough for your pitcher and middle infielders to be able to see your fingers, but not wide enough for the 3rd base coach to get a glimpse. Use your mitt, holding it below your knee, to shield the 3rd base coach and have your hand against your cup when flashing signs. With runners on base you’ll be forced to use an indicator in addition to the sign. The indicator alerts the pitcher and fielders the next sign is the pitch you want. All other signs are fakes. When flashing signs, don’t do it in slow motion, but don’t zip through them either. Slowly, puts everyone to sleep. Too rapid and everyone is confused. Sometimes it’s good to stop and think about what your doing, as the adrenalin speeds up, sometimes affects the fingers will too, without realizing it. When a relief pitcher comes into the game, call time before or after his warm up throws, and review the signs with him. The worse thing that can happen is have the catcher expecting a change up and the pitcher throws a curve ball in the dirt with the winning run on third base. There are numerous methods you can use to signal to the pitcher where you want the pitch located. (1.) You can have an actual finger sign. (2.) You can pat the inside of either knee indicating you want the pitch inside or outside. (3.) You can turn your mitt over and move it up & down indicating a low location or flip your thumb upwards to indicate high in the strike zone. As the pitcher goes into his windup shift your entire body to the left or right depending on where you want the pitch. This gives him an entire body as a target instead of just the mitt, which of course should be enough, but any extra help is always appreciated. 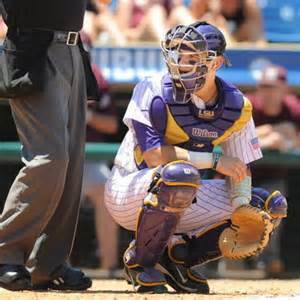 One final thought on Catcher Communication and signals to the pitcher. Ever notice while watching a major league game that the Catcher will always give a quick glance up at the batter. Why? He wants to make sure he’s not trying to catch a peek at the sign while acting like he’s adjusting his stance.